On our recent trip to Crossroads Farm, it worked out best for the team to fly into Indianapolis and then drive up to Michigan. On our way back to the airport on Monday, I texted Wayne Schmidt, the general superintendent of The Wesleyan Church. Wayne prays for Dirt Roads Network daily. I let him know we would soon be driving right by The Wesleyan Church headquarters. I asked if he would take a minute and pray with us. Wayne encouraged our team to stop by for prayer. As God would have it, the executive cabinet of The Wesleyan Church was meeting that day. The executive cabinet circled around us and prayed over us. Wayne prayed that God would use Dirt Roads Network to inspire hundreds of rural churches around the country and unleash a rural church planting movement. It was a moving, Spirit-filled, experience for our team. We left humbled and encouraged. 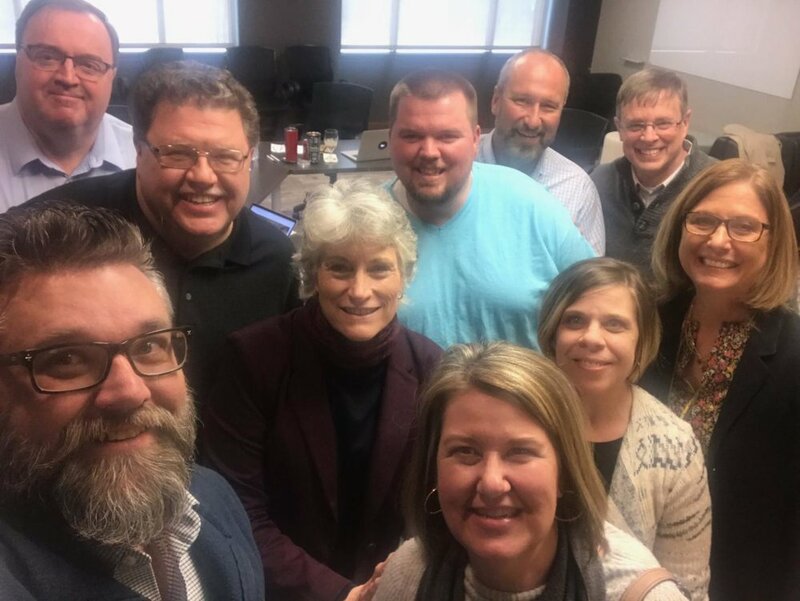 Interestingly, among the executive cabinet members who prayed for us was Russ Gunsalus, the education and clergy development executive director. He also happens to be a man who came to Christ as a teen under the ministry of Rev. H.K. Busby (LWC’s founding pastor.). There is a picture of Russ in Rev. Busby’s memorial book when he was graduating from Bartlesville Wesleyan College (now Oklahoma Wesleyan University) and Rev. Busby was receiving an honorary doctorate. It is such a blessing to see God’s past, present and future handiwork everywhere He takes our Dirt Roads Network team. Thanks to all of you for your continued prayers and support along the way.